Many Cydia app stores have shutdown that were easy to use and provided with lot of quality cracked apps for iPhone, iPad and iPod, Installous was a very popular source for cracked apps. Any old jailbreak user would know the worth of it. This great communitiy provided with quality free cracked apps that were available for download easily. And you could install these apps easily on your iOS device using Cydia. But after shutting down of these there are new app stores coming in the market which are trying to compensate the loss of these Cydia app providers. Earlier I have discussed about AppCake and how to add Appcake from Cydia to iOS 8,7.x,6.x. Here I have shared a tutorial on how to install vShare Cydia version. vShare is also getting popular day by day and its database is emerging with a allot of quality cracked apps for your jailbroken iOS device. So if you are sad because of losing Installous don't be. 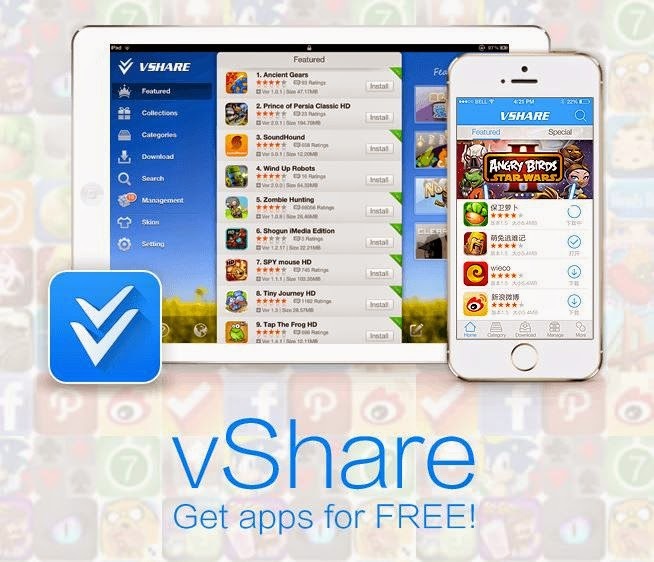 Just install vShare or Appcake and give them a try. Before proceeding further just check a few things. This tutorial is for jailbroken iOS devices. That is your iPhone, iPad or iPod needs to be jailbroken and Cydia should be installed on it. If you don't know much about Cydia read these articles - What is Cydia?, Jailbreak iOS 8.1.2 for Cydia using TaiG tutorial [Windows Users]. If your iOS device is jailbroken already then just ignore these steps and proceed further. Make sure you are connected to internet, use Wifi as it save your packet data and will provide greater internet speed. 2. Go to "Manage" option. 4. It will now ask you for Cydia/Apt URL. Enter the URL "http://repo.appvv.com". This is the official Cydia source for installing vShare. 5. Now tap on "Add Source". 6. A warning message will appear. Tap on "Add Anyway" and continue. 7. Now search for "AppSync". Install the latest version of AppSync so that it works on iOS 8 too. 8. Once you have successfully installed AppSync now go back and search for vShare on Cydia. 9. Tap on the vShare app and install it. While installing vShare and AppSync do check that the source is Appvv as Appvv is the official source for vShare. Also see - Popular Cydia lockscreen tweaks for iPhone. So these were some simple steps on how to install vShare Cydia version. Now vShare cydia version is successfully installed on your jailbroken iOS device. Install the latest cracked apps and do test them. But do remember that these apps were developed by putting a lot of time and hard work by developers. And you are using downloaded cracked apps for free. Just try these apps and if you like them do buy them from iTunes store. Install vShare for checking apps only.